Audi announced details for the all-new A6 Avant: the business-class station wagon in Europe. The new A6 Avant has plenty of engine options to choose from - two gasoline engines and four diesel engines. Shedding off the weight with lightweight aluminum framing while improving the engine performance, the A6 Avant is able to offer as much as 18 percent improvement in fuel economy (47 mpg) over the previous models. Audi A6 Avant is targetted to be at your local Audi dealerships in second half of 2011 at a base price of 40,850 euros. Audi is launching the next generation of the A6 Avant, the most successful business-class station wagon in Europe. The new model presents the brand’s full array of progressive technological expertise. Its lightweight body, large portions of which are made of aluminum, sets new standards, as does the wide selection of assistance and multimedia systems. The keyword for the latter is Audi connect. The new Audi A6 Avant is available with a choice of six engines: two gasoline engines and four diesel units. Fuel consumption has been reduced by as much as 18 percent compared with the previous model. Topping the engine lineup is the new 3.0 TDI with twin-turbo technology and 230 kW (313 hp). Audi also offers numerous high-end options for the drivetrain and the chassis. The luggage compartment has a capacity of up to 1,680 liters (59.33 cu ft) and offers a number of elegant features, including a power rear hatch that opens in response to a sensor signal. Audi is once again leading the way, with the new A6 Avant the trendsetter in the business class. With its lightweight body and many additional innovations, the seventh-generation A6 Avant is intended to write another chapter in the model series’ history of success. Measuring 4.93 meters (16.17 ft) in length, the Audi A6 Avant makes a very agile first impression. Its proportions are sporty, and the low roof line flows into flat D-pillars. Audi offers LED headlights and rear lights as a visually and technically fascinating option. The new Avant sets standards with its low weight. With aluminum components comprising roughly 20 percent of the body, Audi – the global pioneer in lightweight construction – has raised the bar once again. Gross weight has been reduced by as much as 70 kilograms (154.32 lb) compared with the previous model. 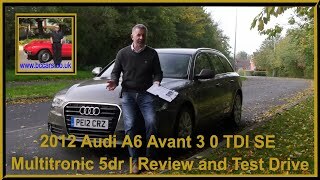 The A6 Avant 2.0 TDI, for example, has a curb weight of just 1,640 kilograms (3,615.58 lb). The luggage compartment has a capacity of 565 liters (19.95 cu ft), which can be increased to 1,680 liters (59.33 cu ft) by folding down the rear seat backs. Audi offers its customers numerous elegant features as options. Topping the list is a gesture-controlled, automatic rear hatch. Through the combination of the power luggage compartment hatch and the convenience key, a particular movement pattern below the rear bumper activates the system and the hatch opens automatically. Audi offers a choice of six engines featuring direct fuel injection for the new A6 Avant: two gasoline engines and four TDI units. They develop between 130 kW (177 hp) and 230 kW (313 hp). This ample power is combined with groundbreaking efficiency. The 2.0 TDI consumes an average of just 5.0 liters of fuel per 100 km (47.04 US mpg). All of the engines utilize the technologies from the Audi modular efficiency platform, which have helped to reduce fuel consumption by as much as 18 percent. Depending on the engine, the new A6 Avant rolls off the assembly line with either a six-speed manual, the sporty seven-speed S tronic, the continuously variable multitronic or the convenient eight-speed tiptronic. In addition to front-wheel drive, the latest development stage of quattro permanent all-wheel drive is available as an option. The optional sport differential flexibly distributes the power between the rear wheels. The chassis is also very sophisticated and combines sporty dynamics with excellent comfort. The Audi drive select driving dynamics system comes standard, and the new electromechanical power steering is extremely efficient. In the front-wheel-drive variants, the ESP electronic stabilization program featuring an electronic limited slip differential make the car’s handling even more precise. Options include the adaptive air suspension and dynamic steering, with the latter becoming available somewhat later. The interior of the new A6 Avant treats its occupants with a sleek and clear design, uncompromising workmanship, generous appointments and exemplary ergonomics. Among the high-end options are a head-up display, adaptive light with variable headlight range control, front seats with ventilation and massage function, and numerous infotainment components. Topping the range of infotainment options are the hard drive-based navigation system MMI navigation plus and the Bang & Olufsen Advanced Sound System. Audi connect, a fully fledged Internet connection, also places the new Audi A6 Avant at the head of the pack. In collaboration with Google, it brings special online services to the car, including voice-controlled points of interest (POI) search. A Wi-Fi hotspot allows passengers to surf and email freely while on the road. The Audi online traffic information service informs the driver in real time about how heavy traffic is on the selected route. The new A6 Avant can be equipped with all of the brand’s assistance and safety systems for even more composed driving. Some systems work closely together with MMI navigation plus, further enhancing their capabilities. A new feature in the Audi lineup, the parking system plus with 360° display, will be available somewhat later. Four small cameras record images of the vehicle’s immediate surroundings. Fast software combines these images and displays them in a variety of views on the large onboard monitor. The Audi A6 Avant will be available for sale in the second half of 2011 at a base price of 40,850 euros. The design of the newest model reflects lightness and modern elegance. It is every bit as characteristic for Audi as the sporty proportions. The Audi A6 Avant measures 4.93 meters (16.17 ft) in length and 1.87 meters (6.14 ft) in width, but only 1.46 meters (4.79 ft) in height. Its wheelbase has grown to 2.91 meters (9.55 ft) – a big gain over the previous model. The engine hood stretches out far to the front; sharp edges frame taut surfaces over the entire length of the flanks. The low, early-sloping roof line and the flat D-pillars underscore the dynamic styling. The characteristic rear lights and the exhaust system’s two tailpipes accentuate the rear of the car. The optional S line exterior package provides for an even more dynamic look. The optional LED headlights, which use light-emitting diodes for all functions, are another innovative feature. They make the front end with the single-frame grille featuring angular upper corners and high-gloss black struts even more distinctive. The xenon plus headlights, optionally available either on their own or integrated into the adaptive light system with variable headlight range control, provide excellent illumination of the road in any situation. The xenon plus units and the LED headlights are combined with LED rear lights. A new composite construction concept makes the body of the Audi A6 Avant highly rigid, safe and unusually light. Many components of the occupant cell are fabricated from high-strength and ultra high-strength steels. The strut braces in the engine compartment and the bolt-on body components are made of aluminum and comprise roughly 20 percent of the body. The concept represents the transition to the innovative Multimaterial Space Frame, with which Audi is opening a new chapter in lightweight body construction. The body of the A6 Avant is roughly 30 kilograms (66.14 lb) lighter than that of the previous model. Depending on the engine, the complete car is as much as 70 kilograms (154.32 lb) lighter than the previous model. The A6 Avant 2.0 TDI, for example, has a curb weight of just 1,640 kilograms (3,615.58 lb). Audi, the sector’s lightweight construction pioneer, has once again reversed the weight spiral. Another strength of the composite construction body is acoustic comfort. Modern materials and construction methods reduce the interior noise level to that of the luxury class. Audi also offers special insulating/acoustic glazing as an option. The precise matching of all components and sophisticated hydraulic damping in the axle and drivetrain bearings provide for excellent ride comfort. The luggage compartment of the new Audi A6 Avant has a capacity of 565 liters (19.95 cu ft). Its loading lip is low. The split rear seat backs can be easily folded down using the remote seat back release on the sides of the trunk to increase luggage capacity to 1,680 liters (59.33 cu ft). Lashing eyes, side restraining straps, bag hooks, a double cargo floor, a rail luggage fixing system, a dirt-resistant tray and roof rails are standard. Audi offers additional details as options – a load-through hatch, a fixing set that uses the two standard rails in the cargo floor, and a power rear hatch with an integrated power luggage compartment cover. Making its debut in the Audi A6 Avant is the gesture-based control of the power hatch in combination with the convenience key. If the driver stands behind the car and makes a specific movement with his or her foot, two sensors open the hatch. The accessories program includes many special features for transporting sports and recreational equipment, from a partition grille to a bicycle rack. The new large Avant is a powerful towing vehicle, with a rated towing capacity of 2,100 kilograms (4,629.71 lb). The A6 Avant is available with a choice of six engines featuring direct fuel injection: one four-cylinder unit and five V6 units. Five of them use forced induction to keep displacement relatively low, thus improving their efficiency. The 2.0 TDI with 130 kW (177 hp) has the best fuel consumption figures. Paired with the manual transmission, it consumes on average just 5.0 liters of fuel per 100 km (47.04 US mpg), corresponding to CO2 emissions of 132 g per km (212.43 g/mile). The 3.0 TDI is available in three variants: with 150 kW (204 hp); with 180 kW (245 hp) – a clean diesel version will follow somewhat later; and the top version with 230 kW (313 hp). The twin-turbo has a two-stage turbocharger group that delivers a maximum boost pressure of up to 3.2 bar, imbuing the 3.0 TDI with superior performance. The sprint from zero to 100 km/h (62.14 mph) takes 5.4 seconds (preliminary value); the electronically limited top speed of 250 km/h (155.34 mph) is just a formality. The 2.8 FSI with 150 kW (204 hp) uses the Audi valvelift system, which varies the lift of the intake valves in two stages as necessary. This allows the engine to breathe easier, increasing torque and reducing fuel consumption. The most powerful gasoline engine in the model series is the supercharged 3.0 TFSI producing 220 kW (300 hp). All of the engines in the new Audi A6 Avant use the technologies of the Audi modular efficiency platform, including the start-stop system, the recuperation system and the innovative thermal management system that quickly brings the coolant and motor oil up to their operating temperatures. These novel solutions are a major reason why fuel consumption has been reduced by up to 18 percent compared with the previous model. Like many Audi models, the new A6 Avant is available with a wide range of drivetrains. Depending on the engine, Audi offers a six-speed manual, the continuously variable multitronic or the sporty S tronic with seven speeds. The 3.0 TDI with 230 kW (313 hp) delivers its power to a highly efficient eight-speed tiptronic optimized for fast shifts. The gears in all of the transmissions are widely spaced, a major factor contributing to their efficiency. All of the automatic transmissions are integrated into the engine’s innovative thermal management system. The differential lies in front of the clutch or the torque converter. This enabled the engineers to shift the front axle forward by 71 millimeters (2.80 in) compared with the previous model, to the benefit of both the wheelbase and axle load distribution. The 2.0 TDI delivers its power to the front wheels. The V6 units are paired either standard or as an option with all-wheel drive. The latest evolution of the quattro permanent all-wheel drive system used in the new A6 Avant features a crown-gear center differential and torque vectoring for superior dynamics, traction and stability. Upon request, Audi will equip all quattro versions with the sport differential, which distributes the power in continuously variable proportions between the rear wheels. So equipped, the Audi A6 Avant rides as if on rails. Sporty precision, powerful braking and superior comfort. The chassis of the new Audi A6 Avant combines all of these strengths to a harmonious whole. A five-link construction guides the front wheels; a track-guided trapezoidal-link suspension is used at the back. The wheel control arms are made of aluminum. The power steering is tightly integrated with the new assistance systems and is highly efficient thanks to its new electromechanical drive. It helps the driver to countersteer when braking on a surface with less grip on one side. Depending on the engine, the standard wheels measure either 16 or 17 inches in diameter, with wheels up to 20 inches in diameter optionally available. Tire sizes range from 225/60 to 255/35. The brake system is designed for high levels of performance and durability. All versions of the new A6 Avant regardless of the engine are equipped with the Audi drive select driving dynamics system, which allows the custom adjustment of key drivetrain, chassis and assistance systems in four modes – comfort, auto, dynamic and individual. An efficiency mode is also available in all models with forced induction. In this mode, all systems are weighted toward fuel economy. Another standard feature in the front-wheel drive Avant models is the ESP system with electronic limited slip differential, which makes the vehicle even more agile. Avant customers can also opt for the comfortable adaptive air suspension with variable damping and the sporty dynamic steering, which will be available somewhat later. The dynamic steering system adjusts the steering ratio to the speed driven and supports handling at the limit with light pulses of countersteer. Audi has designed the S line sports package with particularly dynamic drivers in mind. It lowers the body by 30 millimeters (1.18 in) compared with the standard chassis, and includes large wheels, appearance modifications and many special details for the all-black interior. In the interior of the new Audi A6 Avant, a decorative inlay known as the “wrap-around” encircles the driver and the front-seat passenger. The front of the instrument panel is elegantly curved. The entire interior makes a high-quality and functional impression. It takes up the light style of the exterior. The back seat offers ample passenger room. There are plenty of storage options and cup holders front and rear, with an additional storage package available as an option. Every last detail in the interior of the A6 Avant demonstrates Audi’s exacting quality standards. All of the materials have been selected and worked with great care. Decorative inlays are available in aluminum and three types of wood, including a very modern, novel veneer of alternating layers of light and dark oak. A piano lacquer variant rounds out the choices. The interior colors harmonize as stylishly as the materials, which include a range of leathers up to exclusive Valcona, a very natural grade. Audi offers a choice of particularly comfortable and sporty front seats, with the top models featuring ventilation and massage functions. An optional lighting package or the ambient lighting package bathe the interior in subtle, yet dramatic light. There is also a wide range of options when it comes to the steering wheels: three or four spokes, power-adjustable steering column, heated rim and paddles for the automatic transmission. Like all Audi models, the new A6 Avant impresses with its logical, easy-to-understand control concept. Its instruments are clearly marked; the display between them – optionally available as the driver information system (DIS) with a five or seven-inch monitor – is controlled from the steering wheel. In the center of the instrument panel is a second, power-retractable monitor that is part of the standard MMI radio control system. The innovative Audi pre sense basic safety system, a highly efficient automatic air conditioning system optionally available with four-zone controls, an electromechanical parking brake, cruise control and light and rain sensors are also standard. The engine starts with the push of a button. Audi offers an optional head-up display that projects important information onto the windshield in color. Another attractive feature is the onboard computer with efficiency program. One of the many fields of technology where Audi leads the competition is infotainment. A wide range of modules is available in the new A6 Avant, topped by MMI navigation plus with MMI touch. Core features of the large hard drive-based system with the eight-inch monitor can be controlled via the touchpad. Topping the line of hi-fi options is the high-quality Bang & Olufsen Advanced Sound System that delivers crystal-clear sound from 15 speakers. One groundbreaking option from Audi are the new features that are combined under the keyword Audi connect. With its UMTS module, the Bluetooth online car phone delivers the Internet to the A6 Avant. Special services are available in collaboration with Google. The graphics card in the navigation system, for example, integrates images and information from Google Earth with the navigation route. A Wi-Fi hotspot provides contact to mobile devices on board. Two additional services are new to the Audi lineup, and thus to the market as a whole. The Audi online traffic information service draws on the movement profiles of hundreds of thousands of mobile phones in other vehicles to inform drivers in many European countries about traffic levels along the selected route in real time. Points of interest can now be searched for online with Google – particularly conveniently via voice control. The MMI navigation plus in the new Audi A6 Avant works closely together with the optional driver assistance and safety systems. It makes its route data available to the control units for the adaptive light headlights, the automatic transmission and the adaptive cruise control with stop & go function. This enables these systems to better recognize complex scenarios and support the driver. The heart of the assistance systems is the radar-based adaptive cruise control with stop & go function, which is active at all speeds between zero and 250 km/h (155.34 mph). It works closely together with Audi pre sense, which is available in a number of configurations. It helps the driver in many situations to reduce the severity of rear-end collisions with the vehicle ahead and their consequences, or even to avoid them all together. The new Audi A6 Avant has an extensive package of restraint systems on board in the event of a collision. 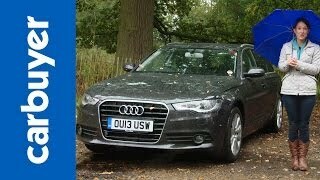 Audi active lane assist intervenes gently in the steering to help the driver keep the A6 Avant in its lane. The park assist system, which is optionally available with a reversing camera, relieves the driver from the hassle of steering when parking or exiting a parking space. The Audi side assist helps the driver when changing lanes; the night vision assistant marks detected pedestrians to make driving in the dark safer; and the speed limit display presents important road signs on the DIS display. The parking system plus with 360° display, which is a new assistance system at Audi, will follow somewhat later. Four small cameras – at the front, the rear and in the housings of the side mirrors – record images of the A6 Avant’s immediate surroundings. Fast software combines these images, and the driver can call up various views on the large onboard monitor. This technical system enhances safety while maneuvering and when pulling out from areas with obstructed views. The Audi A6 Avant will begin arriving in showrooms in key European markets in late summer. Its base price is 40,850 euros.